Don't we all love curry chicken?.Well,maybe depend on the style and spiciness when you consume this unique dish.There are many different version of curry chicken worldwide but I still love Malaysia style curry chicken because I love coconut milk instead of yogurt as the base for the gravy.Hundred years ago Malaysia being at the crossroad of the ancient trade routes,now it's has left a unique mark on the Malaysian cuisine.Last week I promise hubby to cook him a very very mild(not spicy) curry chicken but it's turn up he can't eat my curry chicken at all.He told me it's too spicy and hot for him.His exact word"eating fire and not enjoyable"!.lol! I think he prefer American-Indian style curry which have sweetness texture with yogurt base gravy.Well,I can't please him,so I whack the whole pot by myself! Honestly, I dunno how to cook non-spicy curry chicken. 1:Wash and cut whole chicken leg,drain set aside. 2:Prepared wok or large soup pot at high heat.Add in homemade sambal belacan spices ,kaffir lime leaves and curry powder in the wok,stir until it fragrant or 2 minutes before add in cut chicken and coconut milk. 3: Let the chicken meat simmer at medium heat for 10 minutes.Add in sugar ,salt ,chicken bullion and milk.Adjust the seasoning to your taste.Let the meat cook for another 10 -15 minutes or longer before removed from the heat. 4:Serve warm with rice,roti or noodles. You can use any meat or any part of chicken for this curry.If you want a healthier version ,cut down the coconut milk and replace with non fat milk or yogurt.You can add in potatoes or carrot into the curry.Usually the curry chicken taste better the next day. I'm submitting this recipe to Weekend Wokking, a world-wide food blogging event created by Wandering Chopsticks celebrating the multiple ways we can cook one ingredient. The host this month is Preciouspea and the secret ingredient is COCONUT!!! If you would like to participate or to see the secret ingredient, check who's hosting next month.See yea! I love chicken curry and with that homemade belacan chili sauce I saw below, I bet this tastes wonderful. 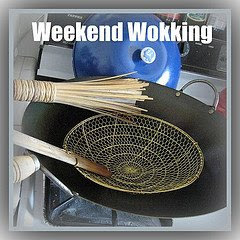 Thanks for participating in Weekend Wokking! This curry chicken eat it with rice or even with roti canai...emmmm...yummy! I really love curry chicken. Your curry chciken look so delicious. Your curry chicken looks delicious! Like you, I like Malaysian curry chicken with the hint of coconut!! Over here in the UK, the curries are too thick for my liking. Yes, with lots of yoghurt. Spicy curry chicken is absolutely my favourite. I tried sending my link and detail to PreciousPea but it kept tendang balik. How about you? Any problem with her e.mail address? Is this curry similar to the one we ate with the roti canai? It was delicious! Thank you ,you to let us participate WW!!. welcome to the SPICY club!!lol! I think to make the curry chicken more sedap add more "belacan"!! that the main key!! I have to request your hubby to teach my kwai lo hubby to eat spices and curry! !lol!.For him everything I eat is fire!! Gert,so far I didn't receive any kick back or confirm email from Preciouspea.I think she still sleeping now! !lol!.anyway,I just copy and paste her email address ,just modified @ and dot.I think you have a better chance not send the wrong address.Yes,I used the same paste from my previous sambal paste but this time I add more belacan! !.I didn't realised I still have plenty of fried belacan! Lol! I doubt I know how to cook non-spicy curry either. Your hubby can't come for a curry dinner at my house so. Even my hubby who can take spicy always complains it's too spicy. I buy my ingredients ready from a market stall which make them fresh and I always tell them not to put too much chilli but it still ends up hot. But shiok! Just wanted to let you know, that coconut milk does work as well as yoghurt in cutting down the spiciness. Me and my husband love spicy food. But when I cook for a large dinner party where a lot of people like spicy food but some do not, then I have a little container of plain coconut milk on the side. (the breakfast milk pot used when serving tea is an ideal size). So for those who do not like spicy food, I tell them to add coconut milk to their bowl of curry to suit their taste and this normally works well with packaged coconut milk. I'm not sure how long, raw fresh coconut milk can be kept to stand, I know it separates if you put it in the fridge. oh!! I love the curry fresh ingrendiets from wet market.I remember my mom just buy the ready make spices from indan store at the market. oh yea,I love your WW entry,very refreshing! When I was in Bali I tried Indonesia curry in coconut milk,quite good but not spicy enough for me!lol! wow!! your hubby are the lucky one! !I think practise make perfect,right? this was the dish that I nearly got the chance to try in Sid´s place isn´t it? Smacking good, old Malaysian style curry you got there! I really like curries of all shapes and sizes and this one looks really good! Making your own sambal belacan paste sounds like fun. Your pictures look good. Seeing your dish I think of bread, for the gravy. Yum! oh!! you're cute Kevin! you said fun making my own sambal !! love you from that! !